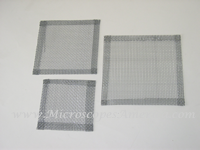 Wire Gauzes for Heating Glass Beakers, Test Tubes; Lab Glassware on Science Laboratory Gas; Bunsen Burners. These w ire Gauzes feature durable metal construction to support beakers and lab glassware as you heat them on Bunsen Burners or any other laboratory heating equipment. 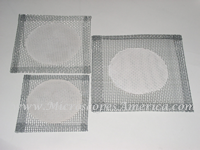 These tightly woven wire pads evenly distribute warmth, and they're available in different sizes for glassware of all volumes. These iron wire gauze squares feature an asbestos-free ceramic center. 10 pieces/Box. Galvanized iron wire squares in assorted sizes. 12 pieces/Box. Galvanized, 16 gauge iron wire with clay pipe stems.